It is our goal as a company to make an impact in local areas through volunteerism and supporting our employees will assure we build a stronger community. 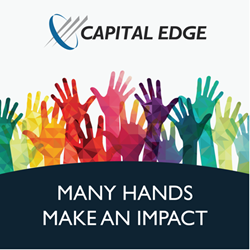 Capital Edge Consulting, Inc., a global consulting firm that specializes in helping federal government contractors solve complex business problems, recently announced their company 2019 volunteer initiative - Many Hands Make an Impact. After supporting the local Ronald McDonald House in Fairfax, VA a year ago, there was a strong desire from team members to continue similar efforts with the support of senior leadership to promote philanthropy. “The roll out of the Many Hands Make an Impact Initiative reinforces the company’s commitment to corporate-sponsored and individual volunteerism in the communities where we live and work,” said Chad Braley, Founder, CEO, and Partner of Capital Edge. “It is our goal as a company to make an impact in local communities through volunteerism and supporting our employees will assure we build a stronger community.” He went on to say. The goal of the Many Hands Make an Impact program is intended to support employee involvement with an opportunity that is personal, whether it is within their own community or with a cause that resonates with them. Recent surveys reveal that employees who frequently participate in workplace volunteer activities are more likely to be dedicated and fulfilled, as compared to those who rarely or never volunteer. This program will serve the community while supporting employee culture. Capital Edge opened the program with an initiative supporting Loudoun Hunger Relief. For 26 years, Loudoun Hunger Relief (LHR) has served as Loudoun County’s primary emergency food pantry, providing food assistance to the hungry and food insecure. Their ultimate goal is to ensure that no one in Loudoun County goes hungry. The Capital Edge team packed bags of perishable and non-perishable food for 200+ families at a popup market to support people impacted by the partial government shutdown as well as others in need the local community. The company plans to roll out several volunteer initiatives and build momentum in 2019 for the Many Hands Make an Impact Program. About Capital Edge Consulting, Inc.
Capital Edge consultants combine their unique backgrounds and experience in consulting, public accounting, industry, DCAA and DCMA to provide clients with unmatched government contracting expertise. This breadth and depth of specialized experience enables Capital Edge to provide the exact services and level of expertise federal government contractors need to succeed. Capital Edge has worked with government contractors ranging in size from startup to Fortune 100 companies in industries such as manufacturing, nuclear energy, professional services, biotech/pharmaceuticals, defense, and software.